Happy Sunday everyone! I hope that you enjoyed your weekend. This was another week of great workouts and I’m happy to report that I hit my goal of a minimum of 10,000 steps per day. While I didn’t do a lot of running, I got my sweat on in a bunch of different ways this week. LEt’s discuss! Spinning (50 minutes) + Push-ups and Tricep Dips (45 seconds each). I took a 20 minute pop music class and a 30 minute hip hop class on the Peloton bike. Both classes were awesome! The instructor, Robin, is SO positive and really funny. I’m looking forward to taking more of her classes in the future. I love that I can take these classes in the comfort of my basement! Plank Jacks + Bicycle Crunches (45 seconds each). It was a really busy day and I also had some bloodwork done, so I opted not to exercise, but I still got in 10,000 steps. Boot Camp Class (55 minutes) + Push-ups and Tricep Dips (60 seconds each). FYI – A lot of bloggers will be running RnR Chicago, and you should too! If you’re interested in signing up, you can use code RNRRNB2018 to save $15 off the half marathon. 3 mile run + Plank Jacks + Bicycle Crunches (30 seconds each). Basic 3 mile run at an easy pace. Stair Climber (15 mins) + Treadmill (15 mins) + Elliptical (15 mins) + Push-ups and Tricep dips (30 seconds each). I’m loving going to the gym after work on Fridays – it’s always pretty empty! 4 mile run + Plank Jacks + Bicycle Crunches (45 seconds each). Holy moly this run was horrible! My legs felt like crap from the start and I’m actually surprised I even got through 4 miles. Lesson learned – do NOT do the Stair Climber the day before a run! Body Works + Abs (45 minutes) + Spinning (45 minutes). I love getting in my #DoubleWorkout Sundays when I can! Total sweatiest from start to finish but it was just what my body needed this weekend after yesterday’s horrible run. Another great week! Although my mileage was really low, I find that I’m enjoying other ways to exercise besides running these days. Maybe I’m in a run funk? Or maybe I just need to step back from the miles for a little while. Either way, I just did what felt right for me this week and that meant less miles. I’m still plugging along with Weight Watchers and I lost 2.2 pounds this week. I’m able with that and at least the needle is moving in the right direction, lol. I really can’t say enough great things about their app. It’s so easy to use and makes tracking everything a breeze. It’s also great to speak with other people on the program through the ‘Connect’ piece of the app (it’s sorta like Instagram). Well that’s it for this week and I’m off to do some meal prep for next week. Thanks for reading this week’s Weekly Wrap! Did you have a good week? Are you currently training for anything? Oh thats great that you talked Holly into signing up too! I am beyond excited to see everyone next month. RnR Chicago is gonna be so fun! I had to DNS it last year with all of my surgery drama, so this year is really gonna be an awesome redemption 😉 I’m glad to finally get to meet you (and several other blogger pals). I’m so looking forward to RnR Chicago weekend. I may or may not have started a countdown lol. Great job with your workouts this week, and congrats on the weight loss! I bet the start climber is really tough. You got in alot of different types of workouts this week which is great! Thanks Lisa! I was happy with the workouts this week even though I still feel like it’s weird to not log a lot of miles! I love to mix up my workouts over the summer it’s fun to switch it up sometimes! Glad to hear that I’m not the only one! Wow! So excited to see how many bloggers are going to be at the same race! You had all better take a group “selfie”. Well done on a great week of training! We will totally take a group selfie! And I hope we can go to lunch too. How fun that there will be such a big meet up in Chicago- wish I could be there! You deserve a step-back in intensity after all your focused training later. Enjoy it! Still a full week of activity. Impressive! I wish you could come too! It’s rare to get so many bloggers at one race, lol. Congrats on the weight loss. That takes more discipline than training I think. My fomo over RnRChi is real! Thanks Coco! You know my friend actually said the same thing. It’s hard to be disciplined but i know it’s going to be worth it in the long run. How fun that you talked a friend into running RnR Chicago with you. I bet that’s going to be a great race weekend! Yes i was so happy to get another friend to sign up for RnR Chicago. It’s such a fun city! I take Fridays as rest days since I’m tired from the week, and I can rest up for my Saturday run. It’s good to put my feet up after a busy work week. I usually do take Fridays a rest day but since I’m not doing super long runs on Saturdays, I decided to try to do a small workout on Fridays. Looks like you got in some great workouts this week! I love the gym on Fridays too, for the same reason you pointed out! Isn’t is awesome?! The gym is always so packed during the week so it’s so nice when its empty on Fridays. Sounds like you had a decent week, though. I need to get back into meal prep, even though it’s just me and I don’t leave to go to work. I’ve started adding in a few other things and suddenly, I’m all over the place all the time! By the time I get home, I don’t even feel like making more than a bowl of cereal. THAT’S not going to fuel my 50k training! What did you prep this week? i have to say that being on WW has forced me to meal prep. If not, it’s very hard for me to find something to eat that’s healthy and stays within my points for the day. This week for lunch I did lemon-garlic roasted cauliflower and lemon garlic chicken (I’ll also eat that with a salad). For breakfast I did steel cut oats and fruit. Nice job mixing it up! I have no doubt running the day after the stair climber would be tough. You are so inspiring with all your workouts. I feel like a slug. I did have a good week – nice cool temps and a mid week 5K. I have a 15K on June 30 and then my next half is RNR Montreal – Come!!!!!! Thanks so much Darlene! I am very much looking forward to RnR Chicago next month – should be fun! glad that you had an awesome week! I love that you talked Rachel into doing RnR Chicago! So many of my virtual blogging friends will be there! I can’t wait to hear about everyone’s adventures! I hear you on the downtime. I think I’m taking a down year! Ha! Great week for you. Glad you’re enjoying Peloton SO much! You’ve had a very busy year so far so I think a break is needed! Can’t wait to see you next month. I got peer pressured to sign up for RNR too! I can’t wait, it was one of my first half marathons years ago. It’s cool to see how you got so many different workouts in, nice job! Thanks Teresa! They do have points for wine – I think it’s only 4 points a glass which isn’t too bad! i hope that you may be able to squeeze in a trip to Chicago for the RnR race. I’d love to meet you! I usually focus exercise other than running for a few weeks after a goal race. It’s really helpful mentally to not be so focused on running goals for a bit. That sounds like a great idea. I usually jump back into running after a race which isn’t the best thing to do! I have my first half marathon in August and I’m trying to put together an actual training plan. I’ve never actually used one and I feel like I should change that haha. 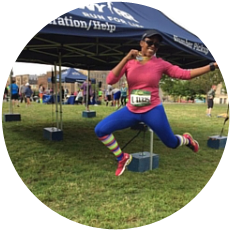 so exciting that you are tackling your first half marathon – congrats! I can send you the plan I used for my first half marathon if you think that would be helpful – just let me know! No training on my end, just a bunch of gymming. Ugh. It looks like you had a great week too! I also have the 10K steps a day goal and almost always meet it (although not all the time on a rest day or a day when I say, cycle or lift for a workout). But it’s not hard if I run or elliptical. So glad you got to share some runs and workouts with friends, and it looks like you have a ton of variety too. It’s so hard to get in 10K steps on a rest day! I’ve been doing “active recovery” on my rest days so that I can get in my steps. Super jealous of your RnR Chicago! I really want to go, but we already have travel plans for the summer, so I got vetoed. I need a a travel fairy godmother, for real! Nothing major on the calendar right now. It’s too hot and humid to really feel motivated. Haha totally parallel lives right now! Bodypump before intervals sounds super hard! How did you get through it? I so wish you could come to RnR Chicago but totally understand as that would be a super long flight for you. WENDY MADE ME DO IT! I’m excited to meet you in Chicago along with other bloggers I haven’t had a change to meet. Girl, a 2 pound weight loss for a female is fantastic! Keep up the good work. It sounds like the app is a great tool as well. Thanks for linking! HOORAY! So glad that Wendy talked you into coming. Sometimes peer pressure can be a good thing! I’m happy with a 2 pound weight loss in a week because I know it’s so much harder for women to lose weight. Sometimes it’s really fun to mix it up with other things than running. Thanks Judy! I was happy with the 2.2 loss. I know the weight loss might stall for a little bit, but I’m still going to keep working the program! I only signed up for 3 months but I feel like I might continue after that. Wish you could come to Chicago but totally understand – that’s a busy time of the year for half marathons. It would be fun to meet more bloggers but the next couple of months are going to be busy for me! Yay for peer pressure! Lol. We all need someone to push us sometimes. Really excited to see how your training goes! sometimes peer pressure is a good thing! Thanks Cari! I’ve heard great things about the previous WW programs as well. Sounds like a great week of workouts! Wish I could be there for RnR Chicago! I’m training for my 3rd marathon and hoping training won’t go too bad while traveling to Europe next week! Definitely a great group of ladies for RnR Chicago! Good luck with training and hope you have fun in Europe! That’s awesome you talked Rachel into RnR Chicago. Great week of workouts! Yes I was very happy I was able to persuade her to come! Peer pressure always seems to get the best of us, even when we do everything that we can to avoid falling into its trap. I hope that you have fun running RnRChicago. It sounds like a great group of you will be there! LOL that’s so true, but I am really looking forward to Chicago knowing that so many people will be there!